There’s a lot going on right now in Cooking Up Romance land! Emma Barry and Genevieve Turner released their new historical romance set in the 1960s on Tuesday, Star Dust. It’s the first book in their series about mid-century astronauts. A couple weeks ago I drove down to where Emma lives and helped out with a series of posts about 1960s food, which finishes up this week. So head over to Emma’s blog and check it out! The next big piece of news is that after a few years of kicking around the house reading romances and baking up a storm, I decided to try my hand at baking professionally. I was actually surprised by how fast I found job. Of course, that will leave me a little less time for blogging, but I’ll try to keep up my normal posting schedule as best I can. And because I’ve been promising the big reveal for a week, I can now tell you where I’m working! I’m baking for Ridiculous Cookies, which is ideal because their cookies are sold online! I’ve been seriously enjoying work thus far. Plus the cookies are great. My favorite cookie thus far is the Dark Chocolate Biscotti with Crushed Espresso Beans. And there are a number of options for folks with all sorts of allergies including dairy free and nut free options. And then there’s these Biscotti Crumbles with Dark Chocolate and Espresso. These are so much fun I immediately asked to take some home and see what I could do with them. 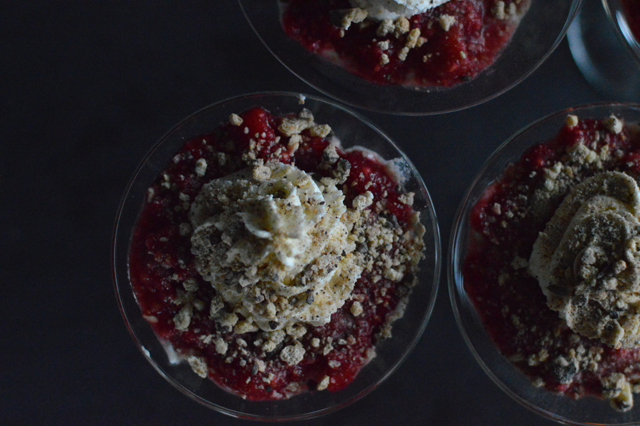 Serving them spooned over ice cream is a no-brainer, but I had some ricotta cheese and raspberries in the fridge so I whipped up these really gorgeous, crazy easy, not-too-sweet dessert parfaits. I’d say the individual components could be made ahead of time, but best to layer and then serve these immediately. So good. 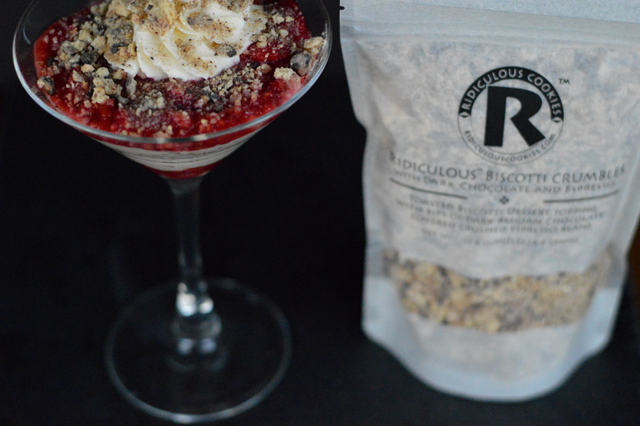 A not-so-sweet dessert parfait featuring Ridiculous Cookies Biscotti Crumbles. Sift the powdered sugar into the whipping cream. Using a hand mixer, whip on medium until stiff. Combine raspberries, sugar and Marsala or water and mix well. Mash raspberries with a spoon leaving some texture to the raspberries. In a medium bowl, combine ricotta, cinnamon and allspice. Sift in powdered sugar. Mix well to combine. Fold in 2 tablespoons whipped cream. 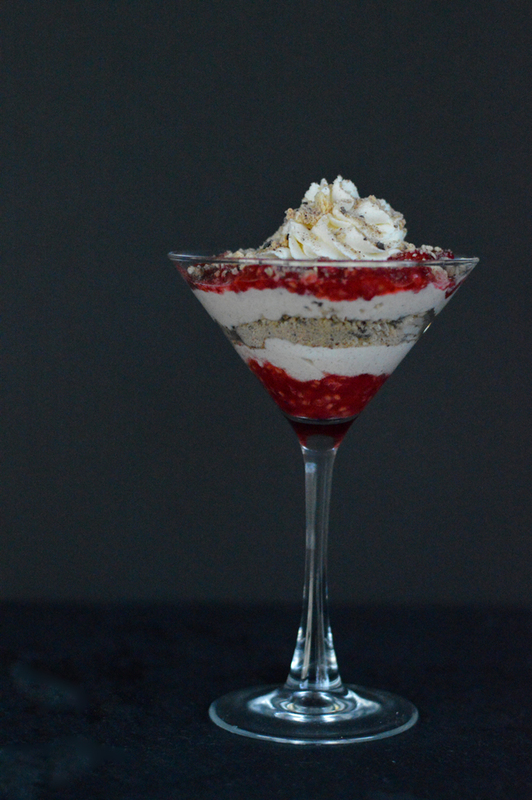 Taking care to maintain each layer, in the bottom of 4 martini glasses or other dessert glasses, place one tablespoon of raspberry, 2 tablespoons of ricotta mixture, 2 tablespoons of biscotti crumbles, 3 tablespoons of ricotta mixture and 2 tablespoons of raspberry. 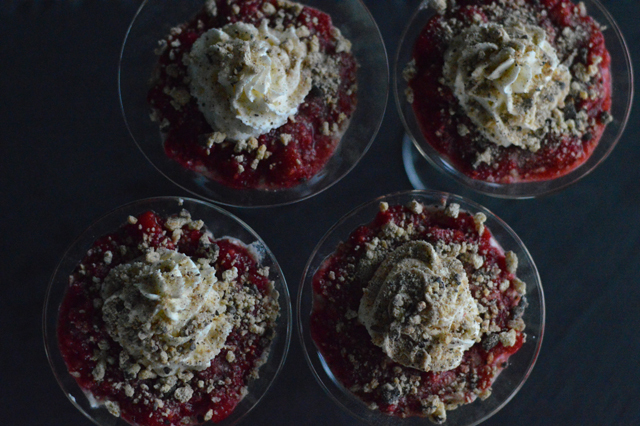 On top of each glass, scoop or pipe approximately 1 1/2 tablespoons whipped cream and scatter an additional tablespoon of biscotti crumbles on top. Raspberry mixture and ricotta mixture can be prepared up to 24 hours in advance, but wait to spoon into glasses until ready to serve. Disclosure: No one is paying me to talk about Ridiculous Cookies. 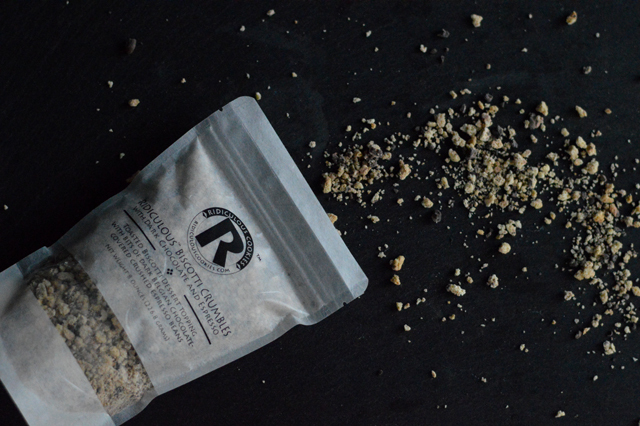 I get paid to bake and my boss let me take home a couple bags of the biscotti crumbles free to experiment with, but mostly I’m just super excited to be finally baking professionally and to have a fun new ingredient to play with. Does anybody remember coffee, coffee, buzz, buzz, buzz? I could not have gotten through college finals without it. Just sayin’ — in reference to coffee bean crumble stuff.